Euro RSCG Chicago has created a print campaign for its footwear retailer client O&I Shoes. The ads, which break Monday and focus on the retailer's fashionable but practical to wear line of footwear, carry the headline, "Comfortable Shoes You'd Actually Be Caught Dead In." 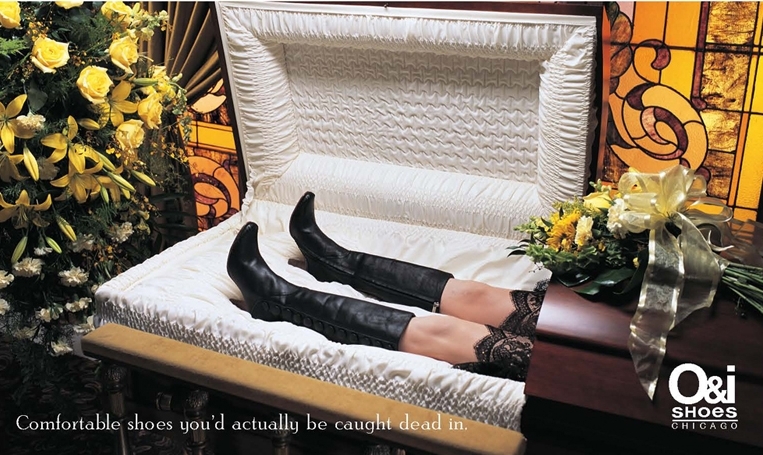 With images of fashionable footwear-clad women on a morgue slab and in a coffin, we're betting this campaign just might give cause for the reader to pause a bit before turning the page. See both versions of the ad . I believe Sally Hogshead would have a lot to say about this. Yeah like how I managed to turn the CPB francise into California bankruptcy. Go Sally! Yes, I'm sure Sally would have a lot to say about this, Vic. I'm guessing it would go something like this: "People have the same ideas all the time." I know the team that worked on this, and they'd never seen Hogshead's ad. (Not everyone has their heads buried in the awards books seeking "inspiration".) Any CD with more than a couple years in the business has seen different teams come up with virtually identical concepts. You imply this team is unoriginal, but doesn't coming up with the same concept make them equally creative as Sally? Here's an experiment. Post your book online. If someone had one of your ideas before you did, I'm sure you'll welcome being outed as a thief. If we follow your rationale, that's what it makes you. In short, don't label people when you haven't a clue. Yes, people do have the same ideas all the time (www.coloribus.com/admirror). But do all of them have a pun as bad as "Shoes you'd be caught dead in"? Feel free to lecture me on puns now. I'm glad we agree people come up with the same ideas. So...why, again, did you imply this ad was stolen from Sally? As for the copy being bad or good, everyone has an opinion. But that has nothing to do with your original critique. Sp how about this rule (of the "golden" variety): we shouldn't suggest others have borrowed ideas when we have no idea if it's true. It's simply the fair and decent thing to do, and how we'd all want our own work to be viewed. Actually this ad has been done before at least twice. See link below. What a unique way to promote footwear. How do people come up with such crazy ideas? I bet they are selling twice as much as any other company.